Having diarrhea can be an incredibly embarrassing and distressing experience which can have serious consequences on one’s health if left untreated. Fortunately, even the most severe forms can be successfully treated by just eating the right foods. 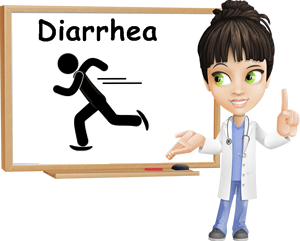 Diarrhea is a condition that exposes the human body to great distress. Not only does it hit at the most inappropriate times, but it is also accompanied by dehydration, nausea, vomiting and stools so loose that you barely have time to reach the bathroom. 1) White rice. The first and single thing you need to eat as soon as diarrhea strikes is boiled white rice. You can add a pinch of salt. Sodium helps retain water and counteract dehydration. If simple boiled white rice is not enough to get you to eat, you can grate an apple over it to add flavor and combat nausea and lack of appetite. Apples contain pectin which helps bind the loose, watery stools. But why white rice? Well, white rice is devoid of dietary fiber and thus helps make stools considerably firmer. A serving and a half of boiled (or steamed) white rice two or three times a day is enough to treat you diarrhea almost entirely. 2) The leftover water from the boiled white rice. The water left in the pot after you have boiled the rice is just as good as the rice itself because it helps achieve firmer stools. Think of it as a sort of flavorless rice soup or a rice drink and drink a cup every few hours to help give consistency to loose stools. Depending on the severity of the diarrhea episode, you may need to continue eating boiled white rice and drinking the water left after boiling it for several days. 3) Baked white bread or toast. You can take a few slices of plain white bread (again, no dietary fiber in it), throw them on a tray and bake them for 15-20 minutes in the oven. Or simply buy toast or baked white bread at the supermarket. If you are not lactose intolerant, you can add a few very thin slices of hard cheese to the bare toast. Hard cheese in particular has a slightly constipating effect and proteins that are harder to digest, increasing transit time, both of which help relieve diarrhea. Plain or salted crackers are also a good alternative for when you feel like nibbling on something, but make sure they do not contain additives or preservatives because they may upset your already sensitive stomach even more. The fact that they contain a little salt can help counteract dehydration because diarrhea makes you lose important electrolytes such as sodium (potassium, magnesium) which are crucial for maintaining normal blood pressure levels. 4) Carrot, string beans and potato soup. For more severe diarrhea episodes, consuming solid foods is mandatory. But you also need liquids, just a bit of dietary fiber to help maintain a normal transit and variety to help you get eating and overcome everything. Throw 2-3 sliced potatoes, a handful of green beans and 4-5 medium-sized carrots in a pot of boiling water, season with salt and a tablespoon of olive oil at the end and eat small servings with lots of toast. You can also only eat the vegetables on toast and alternate with boiled white rice. 5) Applesauce. The pectin in apples and apple sauce helps bind stools together and make them firmer. Pectin is also a demulcent, meaning it sort of protects the mucous membranes of the stomach and intestines, indirectly contributing to reducing inflammation and pain. Applesauce (or freshly grated apples added to your boiled white rice) adds much needed natural sugars to your restrictive diarrhea-diet. However, you should adapt your recipe to the needs of your sensitive stomach: avoid refined sugar and irritating spices. In other words, make your apple sauce only from apples and water so it is easier on the stomach. 1) Lots of water. No matter its severity, diarrhea will cause dehydration. In order to avoid this, drink lots of water, preferably bottled so as to avoid contamination risks, especially if you are on holiday in a foreign country. Also, look for bottled water containing generous amounts of magnesium and small amounts of sodium. While sodium helps combat dehydration by encouraging water retention, the magnesium in the water will replace what is lost through dehydration and contribute to maintaining good cardiovascular function (see article on Magnesium Forms: Which to Choose?). 2) Peppermint tea. Add more flavor and variety to your boring diarrhea-diet with peppermint tea. Not only is peppermint great for treating nausea and vomiting sensations, but it also helps combat loose, watery stools. For best results drink 2-3 cups a day and avoid adding sugar or milk to the infusion for the first few days of treatment. 3) Oral rehydration solution, sports drinks. There are rehydration solutions made especially to counteract the side effects of diarrhea (see Dehydration Remedies and Treatment). Rich in electrolytes such as potassium, magnesium, calcium and sodium, oral rehydration solutions are the quickest and safest way to replenish lost liquids and regain vitality. If those are not available, a sports drink with vitamins and minerals (exactly what you need) is the second best solution for diarrhea dehydration. Just remember that sports drinks are not the same thing as energy drinks and you should absolutely avoid energy drinks. Although strict, this simple dietary regimen should help treat your diarrhea naturally in no more than 2-5 days. But keep in mind that your digestive system will most likely be left sensitive by the diarrhea episode, so you will have to go easy on it for several more days. So what to eat after diarrhea? 4) Mashed potatoes (basically boiled potatoes that you mash). 5) Potato and carrot soup. 7) Bananas (ripe, with a few brown spots). 8) White pasta with vegetables (carrots, string beans). 9) Cornflakes with plain yogurt (limited amounts, based on individual response to the yogurt). 10) Alternatively, fresh cottage cheese. 11) Chicken broth (simple vegetables and lean chicken meat). 13) Sports drinks for hydration, in limited amounts. 14) Plain, boiled chicken meat (introduce slowly in diet). Boiled or steamed white rice, toast, white pasta and cornflakes help bind loose stools. 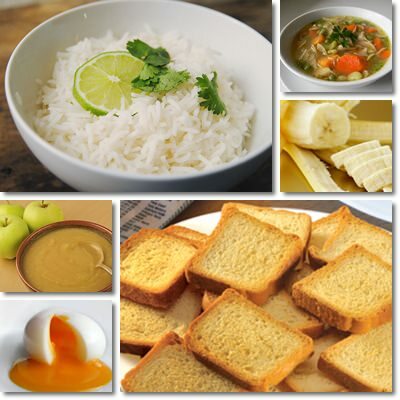 Potatoes, bananas, potato and carrot soup, chicken broths and soft boiled eggs are fairly easy on the stomach and don’t tend to irritate it. Moreover, potatoes and bananas contain potassium to help maintain normal blood pressure and prevent side effects such as tiredness, lightheadedness and fainting sensations. Apples and applesauce are sweet and contribute to firmer stools due to their good pectin content. Plain yogurt contributes to digestive health because it stimulates the growth of good bacteria, but should be consumed in limited amounts and only if you experience a positive response to it. The same goes for fresh cottage cheese (ideally, from pasteurized milk so as to reduce the chances of catching another stomach bug too soon). As soon as you recover enough and feel you can eat more solid food, you can try to introduce plain boiled chicken meat (except for liver). Rich in B vitamins, especially vitamin B12, as well as high in protein, chicken meat has a revitalizing, energizing effect and strengthens the immune system and the body. Sports drinks are rich in dietary minerals such as magnesium, sodium, calcium and even vitamins to help you recover your energy. Remember: sports drinks, not energy drinks (these contain stimulants which are not that good for you or the diarrhea). Mix applesauce with crackers for a fun and interesting taste experience; this will also help balance your sugar and salt intake, prevent hypoglycemia and dehydration side effects such as low blood pressure. When you feel it is time, start incorporating other foods in your diet until you feel good enough to resume your normal eating habits. Still, heavy meals should be avoided because the stomach needs time to fully recover, resume its normal functions and process food properly. Small meals at regular intervals contribute to faster recovery. Avoid seasonings, spicy foods, alcohol, coffee and sugary, carbonated beverages. Additionally, you can take probiotics prescribed by your doctor to help your intestinal flora recover faster. Good stomach bacteria are essential for proper digestion of foods, vitamin production (vitamin K and B vitamins) and overall good gastrointestinal health. If your diarrhea was caused by an infectious agent, your doctor will also prescribe you something to disinfect your gastrointestinal tract, such as furazolidone or give you antibiotic treatment, antiparasitic medication, depending on the cause of your infection.